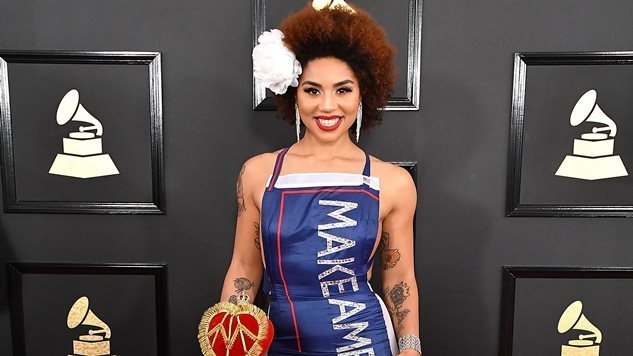 My phone started going off on February 17th, 2017 with friends texting me photos of singer-songwriter Joy Villa wearing a pro-Donald Trump “Make America Great Again” dress on the Grammy Awards red carpet. With my wonderfully strange and varied group of friends, I was only mildly surprised to soon find out that the designer was someone I had not only profiled for magazines before, but who I also considered a friend: Andre Soriano. I consider myself incredibly wealthy when it comes to my friends. People from all walks of life, backgrounds, and everything in between make up a collage that surprises even me at times. If “six degrees of separation” was a contest or game, I would be someone who accidentally won all the time. Call it bragging, but it has its downsides. I have close friends on both sides of the political spectrum. This wasn’t necessarily by choice, but it has worked out pretty well when it comes to understanding the current political mood. This can be a gift or a curse. In the case of knowing the designer behind the “Make America Great Again” dress, it has proved to be an almost numbing experience. It is a very strange feeling when half of the people you know are yelling for a friend’s head on a platter and the other half are suddenly praising him like a God. Like I said: it made me feel numb and, frankly, it paralyzed me for a few months. It’s been almost five months since the “MAGA-dress” made its debut. I still find it fascinating that it is a continued point of discussion on both sides of the aisle. This may have to do with the fact that, in general, there has been a lack of protest art against Trump. I’m not saying that it doesn’t exist, but it is startlingly low in volume when compared to other “anti” periods in history. I think the dress is such a hot-button topic because here was an artist not doing protest art, but instead pro-Trump art. Like most things with the election, people’s response to Soriano’s dress was extreme on both sides. People hated it. People loved it. The positives were extremely positive for Villa and Soriano: Villa’s album skyrocketed to become number one on the music charts. The negatives were ugly: Soriano and Villa both received death threats. It was bizarre for me to watch, as someone who knows Soriano. We hadn’t spoken too much in the year prior to the election, save for the obligatory “Happy Birthday” and fill-in-the-blank holiday greeting. But that’s not to say that my exchanges with Soriano were just rote. With kiss emojis and hearts, Soriano’s effervescent and loving personality always shines through his communications—even through text and email. As someone who writes about entertainment and politics, Soriano was already a fascinating subject to me. He is, unlike me, an immigrant and, like me, he happens to be a gay man. But that isn’t what interested me in him when we were originally introduced. We first met at the 2015 Catalina Film Festival, where he was dressing many of the women in some of the most eye-popping gowns I’ve ever seen. We immediately clicked upon being introduced. My fiancé, Solly, was with me, and along with Soriano’s assistant, we all spent the following five nights hanging out and having a great time. You are, quite literally, trapped on a small island during the Catalina Island Film Festival (and it’s wonderful), so fast bonding is quite common. Soriano is one of those people who everyone wants to be friends with: he’s kind, warm, and welcoming. I found it fascinating that, the first week we ever spent time together, a group of people would always form around him. He has that indescribable warmth and glow about him, yet he is incredibly down to earth. As a writer, it fascinated me that people from every walk of life were drawn to him. He has an effervescent charm and his artistic eye and fashion designs appeal to many people. He blasted onto the fashion scene during a stint on Rihanna’s “Styled To Rock” television series. Since then, he has been an in demand designer, creating clothes for some of Hollywood’s bigger stars. By the end of the festival, I found myself doing an unplanned profile of Soriano for another outlet I write for—he was, truly, that interesting and magnetic. To many, the fact that this dress was designed by Soriano: a gay, (legal) immigrant was, in many ways the ultimate artistic contradiction. How could he justify supporting Donald Trump? Why was this dress still such a topic of discussion? I set out to answer these questions and get the definitive story behind what is quite literally one of the most controversial political and entertainment fashion statements in recent history. What I learned in the end was enlightening. But, what I was surprised to learn in the beginning, was that this dress design started because of Madonna. Well, Madonna said something at the record-shattering Women’s March that greatly upset one of her ardent fans—Andre Soriano. Madonna spoke these words, often quoted without the full context provided above, at the Women’s March the day after the Presidential Inauguration of Donald Trump in Washington D.C. On the other side of the country, Soriano, a longtime fan of Madonna and other celebrities speaking at the march, was distraught at what he was hearing and seeing. It was 22 days before the 59th Annual Grammy Awards Show and Soriano had already been hard at work on a dress for singer-songwriter Joy Villa, who was out of the country at the time. “I was overseas, and we had been talking back and forth on different looks for my Grammy’s 2017 dress, and after sending him my The Static Remixes album and my ideas, we settled on a fiery, phoenix-like look.” Villa explained. Soriano said that, as he watched the speeches at the Women’s March, he eventually had enough. He picked up the phone and called Villa. Soriano and Villa have been friends since 2015 when her old stylist introduced them and she considers him a great friend. “Every Grammys I go to only one designer: Andre Soriano. He listens to my music, knows my taste and my body and always comes up with something exciting and perfect for the moment. “I wasn’t nervous, I was excited. I rehearsed that moment in my mind in Andre’s studio and we both knew it would be a shocker, we just didn’t know how much. I did think that it could potentially be dangerous for me, but I was willing to take the risk. In the end the cape protected me from any attacks and was a fitting touch to the big reveal. I love seeing the video footage of me smiling and hearing the photographers cheer me on!” Villa explained. Not all of her fans were happy, with fans commenting things like “..so sad when you support your own oppressors…” Comments like that flooded Villa’s Instagram following the dress reveal. However, for any fans Villa may have lost, she appeared to gain legions of Trump-supporting fans overnight. By some estimates, her Twitter followers climbed from 20,000 to 100,000 people overnight. Within less than 24 hours of pulling the cape off of her body to reveal the bedazzled-campaign-flag dress that once hung on Soriano’s front porch, Villa’s album skyrocketed to number one on iTunes and Amazon. Her album, “I Make The Static” beat Bruno Mars, Adele, and Beyonce’s record-shattering “Lemonade” album. Villa’s February 13th Instagram post stated to her fans: “We did it! iTunes #1!! Your support and love have changed the nation’s dialogue from one of hate to that of love and acceptance.” Comments accusing Villa of using Trump for her own personal gain were not uncommon. That didn’t seem to matter. The real question was, regardless of what Villa said, did the dress change the dialogue from hate to love? Both Villa and Soriano were suddenly the unexpected darlings of the conservative media. Villa and Soriano—a multiracial (African American, Native American, and Italian) woman and a gay immigrant—were suddenly front and center on conservative-leaning programs like FOX and Friends and Alex Jones’ Infowars. One thing that has remained consistent is Villa and Soriano’s insistence on the messaging of the reason for not only the dress, but the act of wearing the dress to the Grammy Awards. Watching the video, it is clear Villa loved the new monicker. For those on the conservative side of the spectrum, they only see positivity. Dr. Gina Loudon is a psychology and behavioral expert who hosts America Trends with Dr. Gina. Her political and psychological analysis and conservative-leaning views are frequently featured on multiple national TV news networks such as CNN, FOX News, and MSNBC. Dr. Loudon is a close friend of Soriano and was a Trump surrogate during the 2016 Presidential campaign. When Dr. Loudon and I discussed the impact of the dress, I asked her why she believes voices like Soriano’s, a gay, legal immigrant, are important in the current political climate. Andre and I talked about his many friends who are democrats and/or Clinton supporters. I asked him if there had been any backlash. During our talk, he talked about his friend, Daphna Edwards Ziman. Ziman is famously close with the Clintons and even referred to Hillary Clinton as a “mentor and dear friend” in an LA Times article during the 2016 election season. Ziman and her ex-husband Richard Ziman, are well-known Clinton mega-donators and supporters. One thing that many reporters questioned after the MAGA dress was unveiled was whether or not the support for Trump was genuine or a stunt. Less than nine months before the election, in February of 2016, Ziman held a much-publicized gala benefit and Academy Awards viewing party in support of Children Uniting Nations (“CUN”). CUN was founded by Ziman in 1999 along with honorary chairs Hillary Clinton and Bill Clinton to connect mentors with foster children. Openly gay and famed character actor Jasper Cole (“The Purge: Anarchy”, “American Horror Story”, and a million other projects) echoed Ziman as well as many others I spoke with in the LGBTQ community I talked with about the dress. “First of all, I had never heard of Joy Villa or the designer, so it seems to me both only used the MAGA dress to get press. So, I’m sure they think it was a positive impact for them. In fact, Joy has been quoted as saying how much her social media following increased two fold after she wore it. However, I think it had a negative impact on THEM from the LGBTQ community and made both of them look the opportunists they are. Villa herself was called out by other outlets for deleting old pro-Bernie Sanders tweets once the MAGA dress became part of the national conversation. Regardless of whether or not Democrats believe Villa and Soriano are truly Trump supporters, Republicans, and even Trump’s own family have embraced both of them. Sara Galliano, an avid Trump supporter and volunteer from New Orleans, Louisiana, believes Soriano’s voice is important for Trump supporters who identify as LGBTQ. Just a few weeks after the Grammy Awards, a group (that many say breaks stereotypes) called “Gays For Trump” held a rally in Washington D.C. where both Soriano and Villa were keynote speakers. When I asked Soriano if he has had any pushback from the LGBTQ community originally, he mentioned RuPaul Drag Race Season Three winner Raja Gemini as being vocally opposed to him once she discovered he was the designer of the MAGA Dress. One thing that struck me as strange was that many of the most outspoken critics of Soriano were unavailable or unwilling to speak for this article, Gemini included. I attempted to contact Gemini eleven different ways over the course of three weeks before I heard back from a representative telling me Gemini was declining to be a part of this story. Soriano noted this phenomenon when we spoke. To him, he expressed wanting to have a dialogue with his detractors, while they seemed to not even want to hear his side of the story. One thing I found fascinating when reading most articles about Soriano, Villa, and the dress was that most reporters were missing what may be a crucial key to understanding Soriano’s beliefs: Andre Soriano and his family actually grew up under the oppressive hand of dictator Ferdinand Marcos in the Philippines. His mother escaped with Soriano and his siblings under cover of night. Many un-informed people like to immediately label President Trump as a dictator without doing much homework on what a real dictator is…something Soriano knows all to well. America, from Soriano’s perspective, regardless of who is in charge, is always America. Throughout our talks, Soriano repeated to me more than once that America is freedom, liberty, and the pursuit of happiness. America is not a dictatorship, despite what a few ultra-left (and ultra-right) people on social media may want you to believe. To understand Soriano’s support of Trump may be to understand his family fleeing an awful dictatorship. I asked him what it was like growing up under a real dictatorship and how he escaped. Soriano’s voice quiets when he tells this story. It is an obviously emotional subject for him to discuss. “So meanwhile, that’s happening because there [was] a civil war [coming] in the country. A friend of my mother’s said ‘Hey, you have to think of your kids’ future.’ That’s why she relocated us here to America: me, my brother and sister. [At this point], there was civil war in the Philippines and you could see tanks and people stopping the tanks to have peace and everything because they assassinated him (Marcos). The [people] wanted better things for the country and were fed up with the corruption. “It’s always the people’s power. It’s almost like what’s happening in America where there is no civil war or anything. Its all talk, talk, talk—which is great, [but no one] is reporting anything that is right…I’m glad they didn’t go harsh like that (civil war), however, people woke up and said ‘I live in this country and I want the best for this country’ and there is a better chance that Trump is going to change our country for the good.” Soriano’s enthusiasm about being an American is most evident in when he talks about his speech at the Gays For Trump event in Washington D.C. I asked him if he feels anger when people call Trump a dictator on the level of Hitler. A Problem With A Frog? Speaking of frogs, Soriano enthusiastically told me about the MAGA Awards, whose website’s background images prominently feature the controversial “Pepe The Frog” meme that was labelled as a white supremacist symbol of hate by Hillary Clinton and the ACLU. A quick peek at the website shows an email address for a woman named Viktoria Colvin, who was recently featured on an episode of “MAGAOneRadio”, hosted by Peter Boykin, President of Gays For Trump. For some I spoke with, Soriano and Villa’s enthusiastic support of the MAGA Awards is where the questions begin again. In June, Villa attended the Faith and Freedom Coalition where the president spoke. Afterwards, she was invited to the White House by Jennifer Korn, Special Assistant to the President and Deputy Director for the Office of Public Liaison. On Villa’s YouTube, in a video she explains how wonderful the visit was, only to be topped of with a one-on-one session with Ivanka Trump. According to Villa, the visit was wonderful. She spent two and half hours in the White House meeting the likes of Andrew Giuliani and she walked out of the West Wing and suddenly Kellyanne Conway stepped out of a black SUV, as Villa puts it, “in all of her fabulousness”. While both Villa and Soriano continue to receive press from the MAGA dress, the LGBTQ community—both against and for the President—are faced with a conundrum. Though the President may have never come against the L’s, the G’s, or the B’s – in recent weeks, remarks about the T’s – the trans members of the LGBTQ community have raised new concerns. Peter Boykin, the President of “Gays For Trump” who starred in a March 9th, 2017 video with both Villa and Soriano, hosted a founder of the aforementioned MAGA Awards, Viktoria Colvin, on his July 31st, 2017 “MAGAOneRadio” show. On the show, Boykin calls Colvin on his phone and has a private conversation where he responds to a question, after telling her he wanted to talk about the trans issue, and says “Did I say we have to be nice?” before putting Colvin on speaker phone. Boykin explains that he has a special guest on the phone who is going to talk about the “transgender issue with us” and “it’s not going to be so friendly”. He then adds, “We never said our show was going to be friendly”. Boykin and Colvin exchange pleasantries before getting down to Boykin’s main theme. He explains to Colvin that they are going to discuss how there is no right or wrong answer to the transgender people in the military, but they want to talk about elective surgery. “You mean you could tell them that you envision yourself as a woman with bigger breasts and that’s what you feel like you want to be—an uber woman?” Boykin asks. Regardless of this conversation, Boykin has a voice on what his supporters call the “Trump Train” from his radio show, support of the MAGA Awards with Colvin, and being the President of Gays For Trump. When it comes around to the original question about Soriano—how can a gay immigrant justify not only being a Trump supporter, but also design a dress that many say normalizes Trump, the answers vary. Sometimes, the answers to the harder questions end up coming from the most logical sources. Erin Berg is the co-founder of Kipper Clothiers. Kipper Clothiers was born following the repeal of Proposition 8, out of a need to create clothing that inspires pride and confidence within the LGBTQ community. Berg was frustrated by the lack of options for transgender men and lesbian women looking for high-quality, custom-fitted suits. So, Berg decided to start Kipper Clothiers to provide a comfortable and safe space that catered to every body type, despite gender identity. As a fellow fashion designer, Soriano’s choice to create the MAGA dress and the implications that followed, were layered. When I asked Berg about how it made him feel that an LGBT immigrant designed the dress, his response was among the most poignant of everyone I spoke with: “I think that it gave me some pause of the harsh critiques the dress was getting, but my sentiment is still the same. ‘MAGA’ as a concept is racist, homophobic, transphobic, sexist, anti-immigrant that at its core is against everything America is. 1.) Is the dress art? 2.) Is the dress an attempt to normalize someone that progressives feel is radical? 3.) Is a dress, sometimes, just a dress? Yet, one of the most fascinating aspects of working on piecing together what quite possibly is the most interesting pop culture aspect to emerge out of the Trump era was the clear, and surprising, disconnect that both “sides” had with one another. When I spoke with people who did not support Trump, their anger revealed less of an anger towards the dress and Soriano and Villa, but more towards the fact that Donald Trump is President of the United States. When I spoke with pro-Trump supporters, the conversation became more about the “bravery” of Villa and Soriano or the fact that they were gay, minorities, immigrants (or some combo therein), and less about the dress. So, perhaps, the original question isn’t how Soriano can justify being a pro-Trump supporting immigrant and gay man. Instead, perhaps the question is: how can everyone on both sides of the aisle figure out how to start having a proper conversation with each other about Donald Trump being President? The dress accomplished something, whether Democrats or Republicans want to admit it: it allowed what is already a contentious and heated debate to ground and center itself around something. An object. A dress, of all things. Are either of them incorrect in what they say? The answer is no—what their answers are, however—is revealing of how disconnected we all have become due to what feels like not just the political marathon of our lives, but the Olympic marathon of our time on Earth. The truth is, Villa gained supporters, but supporters are different than fans. But, more than anything, shocking as it may be, the Trump supporters and non-supporters, at the end of the day, seem to genuinely have common ground. Whether the world believes Soriano’s dress was art, the point is that it began a discussion. What America is to one person is completely different to another. What the United States means to a gay immigrant who fled a dictator in the Philippines is going to be different from a 7th generation American immigrant. Because, as Dr. Grayson told me, almost everyone here in America is an immigrant. Two quotes from one man, Ronald Reagan, kept running through my mind during the weeks I worked on this article. Perhaps it’s time we all start listening to why we stand for what we do?